Since the beginning of 2015 we’ve had the pleasure of working with MSH INTERNATIONAL. We’ve been busy building out their product, called MSH Aviator, based on our Business Management Platform, DECK DecisionWare. In the conjunction of the first release of MSH Aviator, we sent out a joint Press Release. We are please to have had the Press Release picked up by Yahoo Finance, Market Watch, Insurance Business Canada and Insurance Technology, to mention a few. Of course we are thrilled to see such amazing coverage! 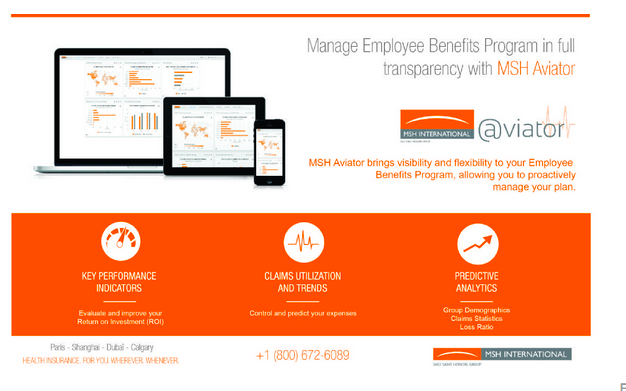 EDMONTON, Alberta–(BUSINESS WIRE)–MSH INTERNATIONAL awards large software project to Spieker Point to maintain their competitive foothold by offering transparency to their customers, providing visualizations of operational data, and improving efficiency of employee benefits management. Spieker Point, an Edmonton based software development company, is excited to bring a high return on investment to MSH INTERNATIONAL who provides expatriate health insurance solutions for employees worldwide. With this new online tool, MSH Aviator, customers of MSH INTERNATIONAL will be able to log in to their account and see information such as premiums paid, amounts claimed, and even predictive analysis – information that is typically not offered by even the biggest insurance providers on the market. In 2014, Philippe de Dreuzy was appointed CEO of MSH INTERNATIONAL’s regional head office for North America, located in Calgary. He is now bringing some much-needed operational improvements. Since the beginning of 2015 we’ve had the pleasure of working with MSH INTERNATIONAL. We’ve been busy building out their product, called MSH Aviator, based on our Business Management Platform, DECK DecisionWare. In the conjunction of the first release of MSH Aviator, we sent out a joint Press Release. We are please to have had the Press Release picked up by Yahoo Finance, Market Watch, Insurance Business Canada and Insurance Technology, to mention a few.